How often do you replace your toothbrush? No matter whether you use a manual or electric brush, your bristles will begin to fray and not clean your teeth as well as they should over time. Brushing your teeth is an integral part of your oral healthcare routine but using an old toothbrush can hurt you more than it can help you! 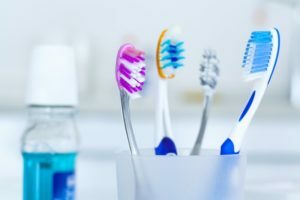 Keep reading to find out why you should replace your brush, even if it’s your favorite, from an expert dentist in Chevy Chase. The average person should replace their toothbrush every 3 to 4 months. If you’ve been sick lately, you may want to replace your toothbrush sooner, so you aren’t brushing your teeth with bacteria stuck in the bristles from a previous illness. If you lose track of the last time you replaced your brush, check out the bristles on the head. If they’re frayed, your brush needs to be replaced because frayed bristles will not clean your teeth as well as they should. These recommendations are made mostly for adults. You should keep in mind that children tend to brush more rigorously than the average grown-up, so they may need a replacement brush sooner than 3 to 4 months. If you use an electric brush, don’t worry because you won’t have to replace the whole brush every 3 to 4 months. Most electric brushes have removable heads, so as soon as you notice frayed bristles, you can simply pop off the head and replace it with a new one. Talk to your Chevy Chase dentist about which toothbrush is best for you. The most important part of choosing a brush is that you pick one that makes you feel comfortable with brushing every day. How Should I Maintain My Toothbrush? Your toothbrush keeps your teeth clean, but it’s your job to keep your brush clean! No matter which type of brush you use, rinse it under water after use to wash away any toothpaste and saliva that are still caught on the bristles. Be sure to store your brush vertically so it can air dry for your next use. Try to avoid storing your brush in a closed container because it can cause bacteria to buildup. If you can, let the bristles completely dry out in between uses to brush in the cleanest way possible. Now that you’re a tooth brushing expert, you’ll know when to replace you and your loved one’s brushes. If you have children or other family members that may not be on top of their toothbrush timelines, buy multiple brushes at the same time so you can keep track for them. That way, when their bristles are frayed and old, you’ll have a replacement ready to go! Dr. Ronan Freyne enjoys building relationships and getting to know his patients personally to provide them with the best care possible. He stays up-to-date on the latest dental practices through continuing education courses on oral healthcare. He currently runs his own practice, where he can be contacted through his website or by phone at (301) 986-0700 for any questions.